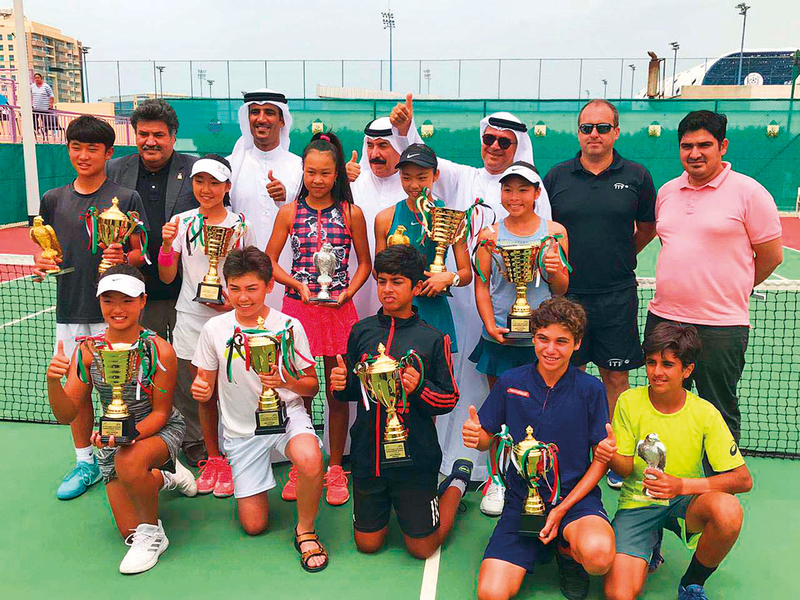 Dubai: At the conclusion of the first Asian Tennis Federation (ATF) U14 event held here in Dubai over the past week, South Koreans Gio Jang and Woohyuk Chang came out on top of the girls and boys singles categories respectively. Both players came into the tournament as top seeds, and showed why, as they dominated the competition on their road to victory. Chang overcame Iranian Kasra Rahmani in the final, who had showcased his strong baseline game in his semi-final victory over Indian Rushil Khosla. However, Chang’s all-round game proved to be too much for Rahmani, as he ended up winning comfortably 6-1, 6-2. In the girls’ singles, Jang was simply unstoppable, as she rolled through to the finals, where she faced off against Dilnaz Mashabayeva from Kazakhstan. Mashabayeva had played the game of her life in her semi-final upset of second seed Ashurbekova Munisa, but could not manage a final victory, as Jang came out on top in straight sets 6-2, 6-2. In the girls doubles, Jang came out on top once again, partnered by Naomi Hagi of Hong Kong. In the final, they overcame unseeded South Korean pair Gaeul Jang and Jaeah Lee in an epic 6-4, 7-6, 10-7 victory. For the boys, singles semi-finalist Khosla proved his mettle by finishing first, partnered by Kazakhstan’s Danir Kaldybekov. They defeated Ege Topkoc and singles champion Woohyuk Chang in the final 6-3, 6-3.